Even though being a blogger, I am not much into social networks like linked in or facebook or orkut. However, few years back, when I heard Oy Lucky! 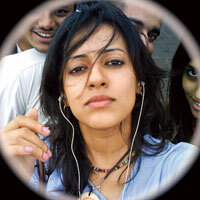 Lucky Oye!’ s soundtrack; I opened my orkut account just to create a fan page of Sneha Khanwalkar. Oye Lucky! Lucky! Oye was a gem in both aspects, visually and musically. I would even dare to mention that I loved OLLO and LSD more than Pulp Fiction! DeeBee’s a master story teller and Sneha Khanwalkar has been his choice of music direction since his previous two ventures. Here is why. Sneha, depending on the genre of her film, picks up a bagpack and ventures out straight to that place. As for OLLO she went to Punjab, she recorded sounds there, found out few singers out of many hidden treasures, and recorded songs keeping the folk flavor and folk accent intact. As a result, OLLO sounded fresh as a breeze. Unfortunately, LSD didn’t require much of such outings but still she visited Rajasthan for a folk song I Can’t Hold It (don’t go by the name). Now, this methodology of Sneha is shown on national television and man, it looks interesting. A show on MTV called MTV Sound Trippin will take us along with Sneha on her journey to 10 different places in India where Sneha will be recording 10 different songs. First two episodes of MTV Sound Trippin are out and songs recorded at Punjab and Banaras respectively have really come out well. I am simply a fan of her again. Keep up the good work Sneha! Well done! Here is some YouTube’d stuff about Sneha Khanwalkar. 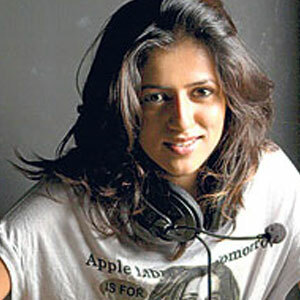 How did YOU find the Sneha Khanwalkar's music. Do comment! WOW - What a methodolody! Seriously loved OLLO's music when it got released and honestly , was quite surprised seeing a woman as Music Director! LSD music is good too , but didnt know of the track - I Can't Hold It , listening to it now , traditional + techno - sounds nice! Loving Sound Tripping , the 1st and 3rd episodes have been awesome . Looking forward to the next Goa one and the whole series infact . Wish Dibakar Bannerjee would have kept her for Shanghai as well . Sneha is a Sensation! Same here , looking forward to GoW's music . Sneha must have churned out the best tunes from the coal mines of Wasseypur! HI Sneha, i love you sound tripin, yo are really genius. My request and suggestion to you that, You have to come to our area, Mangalore and UDupi.. LOvely place, very traditional and rich in cultural background. if you come here you will get amazing sounds for you future project. we are famous for "Yakshagana(Dance), Pilivesha (tiger dance), Bhoota kola (spiritual Dance), here you will get some spiritual, haunting, melodious, and super music. We use drums, chande, etc, etc etc. Please visit our Land, we will welcome you gracefully. I love your effort cz i think you are the first women doing some different work in Music. well done.